Mainichi Shimbun reported further issues at Genkai Nuclear Power Plant in Kyushu. The water leaks follow those at Mihama and Fukushima Nuclear Power Plant last week and a fire yesterday at Tsuruga Nuclear Power Plant (read about it in Fire And Water At Japanese Nuclear Power Plants on Survival Japan). Previous update is available here. It mentioned that there hadn’t been any radioactive material leak, which of course was inexact (although KEPCO tries hard to prove there is no causal link between the leaks and the radiation surge) – incidentally JAPC declared the same regarding Tsuruga today. About Genkai, claims by the local government that radiation levels ″sometimes rises under natural conditions such as rain″ might be half-truths as radioactive rains are not natural conditions, but it is irrelevant nonetheless in the current nuclear power plant leak context. Besides, ″the usual range of 433 to 472 cpm″ is not harmless – it is about 10 times readings I measured elsewhere in Japan (Cf. Geiger Counter Case Study: Inspector Alert on SurvivalJapan – although results in the post are given in uS/h, in fact 40 cpm was a typical value). Nuclear power plants in “normal operation” in the US leak a ″little″ amount of radioactivity which operators must report to the NRC. Japanese nuclear power plants are similar although I am not aware of any such reporting in Japan. SAGA, Japan (Kyodo) — A radiation reading at Kyushu Electric Power Co.’s Genkai nuclear power plant in Saga Prefecture rose slightly above the usual range after coolant water leaked there Friday, the prefectural government said Sunday. The reading at an outlet for seawater cooling the No. 3 reactor’s secondary cooling system was 473 counts per minute at 3 p.m. Friday, against the usual range of 433 to 472 cpm, not high enough to immediately impact human health, it said. On Friday morning, 1.8 tons of primary coolant water containing radioactive materials leaked within the reactor’s purification system. The utility claimed the radiation reading is unrelated to that leak and said it will investigate the cause. Water used in treating low-level radioactive waste is sometimes discharged from the outlet, but that was not the case Friday, the local government said, adding the reading sometimes rises under natural conditions such as rain. Original article may still be available at this link. Further updates with “not so slight levels” or such as “Yukio Edano ordered the last Genkai reactor to shut down” for instance are foreseeable. Mainichi Shimbun reported further issues at Genkai Nuclear Power Plant in Kyushu. The water leaks follow those at Mihama and Fukushima Nuclear Power Plant this week. Previous update is available here. SAGA (Kyodo) — Kyushu Electric Power Co. said Saturday that 1.8 tons of coolant water containing radioactive materials had leaked within a purification system at an idled reactor at its Genkai nuclear power plant in Saga Prefecture. But the utility failed to report the leak to the local governments when it detected it Friday morning, only notifying them of trouble with pumps in the system for the No. 3 reactor, which has been suspended for regular checkups, prompting the Genkai mayor to complain. The water leaked from a joining area of the pumps, with no radioactive materials leaking outside the reactor building, and has been completely recovered, the utility said, adding that the intensity of radioactive matter contained is unknown. On Friday, the company serving the Kyushu region in southwestern Japan said a rise in temperature over 80C at the base of one of the pumps triggered an alarm, but didn’t reveal the water leak on the grounds that it did not go outside the purification system. The government’s Nuclear and Industrial Safety Agency said the leak within the purification system posed no immediate safety threat and urged the firm to investigate the cause. The original article may still be available at this link. Read also a further update here. Kyushu Electric Power Company has halted the No.1 reactor at the Genkai nuclear power plant in southwestern Japan. This means more than 80 percent of the nation’s reactors are now offline. It remains unclear when or if any of them will be restarted. Shortly before noon on Thursday, workers at the Genkai plant began suppressing nuclear fission to reduce output at the reactor. The unit stopped operations at around 8:30 PM. As a result, the No.4 reactor at the Genkai plant is the only one active in the Kyushu region. Kyushu Electric plans to ask households and firms in its service area to use around 5 percent less electricity from December 26th, when the No.4 reactor is scheduled to be halted. In mid-month Kansai Electric Power Company also plans to suspend the No.2 reactor at the Ohi plant and the No.2 reactor at the Mihama plant, both in Fukui Prefecture. These moves will leave the Kansai region with only one reactor online. Kansai Electric plans to urge people to use around 10 percent less electricity from December 19th. Of the country’s 54 reactors, the Genkai No.1 reactor is the 45th to go offline. There are no prospects for restarting the idle reactors as none of them has yet to meet the requirements for resuming operations. These preconditions include passing the state’s safety stress tests and getting approval from local governments hosting the nuclear plants. This post follows up Nuclear Incident in Kyushu published last month on SurvivalJapan. Genkai nuclear plant reactor no. 4 was restarted on November 1st against the local population’s will and without any detailed public report regarding the incident. According to the Japan Times, “The reactor shut down automatically Oct. 4 due to an abnormality in its steam condenser that emerged after repairs were carried out using a faulty manual.” Kyushu Electric Power (KEPCO) simply changed the manual and got approval from the Central Government which found it “largely appropriate” as reported by Asahi Shimbun on November 2nd (read below). In their article on November 1st, the expression reported was “largely acceptable”, any of these leaving a taste of less than diligency and professionalism in a critical system such a nuclear plant, especially in the post-Fukushima context. Genkai Mayor seemed surprised by the move as he declared that “We thought the reactor would be inspected without a resumption of operations. This is something we did not expect.” in the same article. However, he chose not to oppose the Central Government. 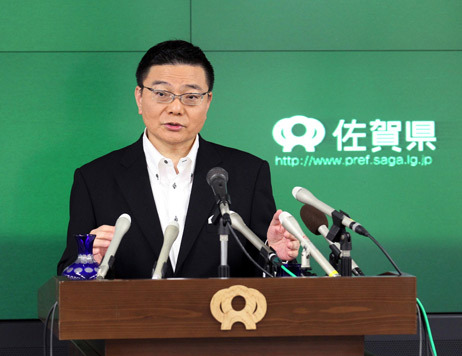 Saga prefecture governor, who was involved in the scandal by KEPCO which was caught manipulating the public opinion in order to restart the plant operations, agreed with the decision. KEPCO president, who was directly behind the fraudulent scheme, did not resign and suffered only a minor salary cut. Eventually, the plant restarted producing nuclear power anyway, which shows that for the Japanese nuclear industry, not only it is acceptable to deceive and manipulate the public opinion, if you get caught red-handed, it does not matter as you can still impose your decision in the end with blessings from local politicians. On the technical side, KEPCO claims that the incident was due to human factor, yet it was the second time this particular type of issue had occured at that very plant.